When the holidays come around, a few classic dishes always come to mind. Like many of us, stuffing, green bean casserole, pumpkin pie, and fresh cranberries are the culinary highlights of my holiday memories. While all of these dishes are vegetarian, they’re not usually vegan. But! With a little creativity you can easily transform these favorites into vegan holiday classics. Nervous about how your meat-eating loved ones will handle the change? 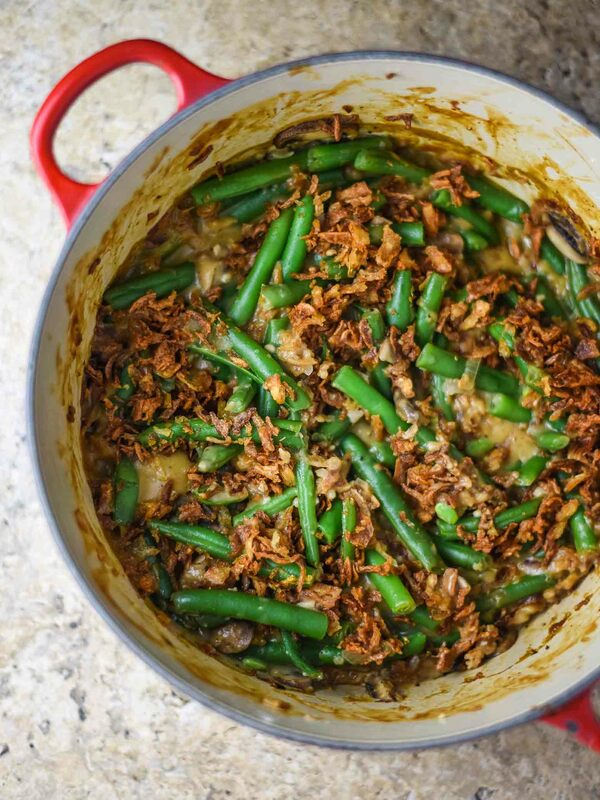 This vegan green bean casserole is consistently given a strong thumbs up from both my vegan and non-vegan friends time and time again. Speaking honestly, casseroles can be crazy bland, which is why I’m thrilled about this one: it’s poppin’ with flavor. 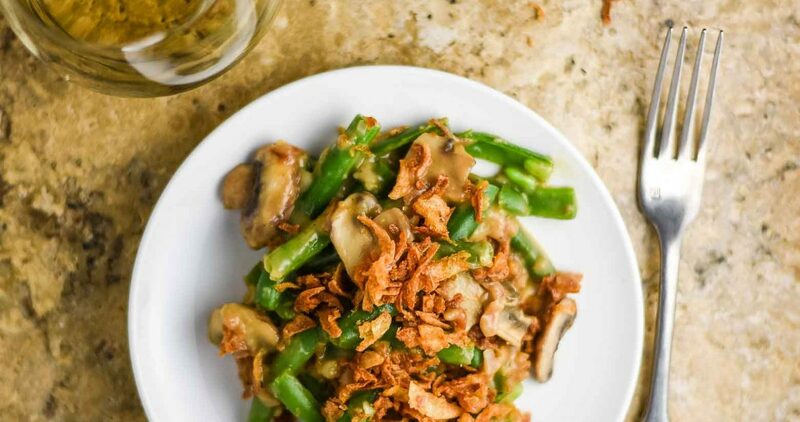 This healthy green bean casserole packs the flavor of fresh green beans, garlicky goodness, earthy mushrooms, and a creamy dairy-free sauce all in one bite. 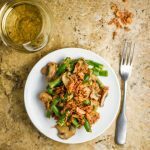 It’s savory, creamy, and satisfying with a delightful crunch from the fried onions, springy freshness from the green beans, and smooth creaminess from the mushroom sauce. Want to turn up the fancy factor? Pair it with a glass of white wine for a holiday themed wine and dine. If you want to make some more healthy holiday meals, check out my vegan lentil loaf, mushroom lentil soup with kale, vegan mushroom risotto, garlic mashed potatoes, and stuffed mushrooms. 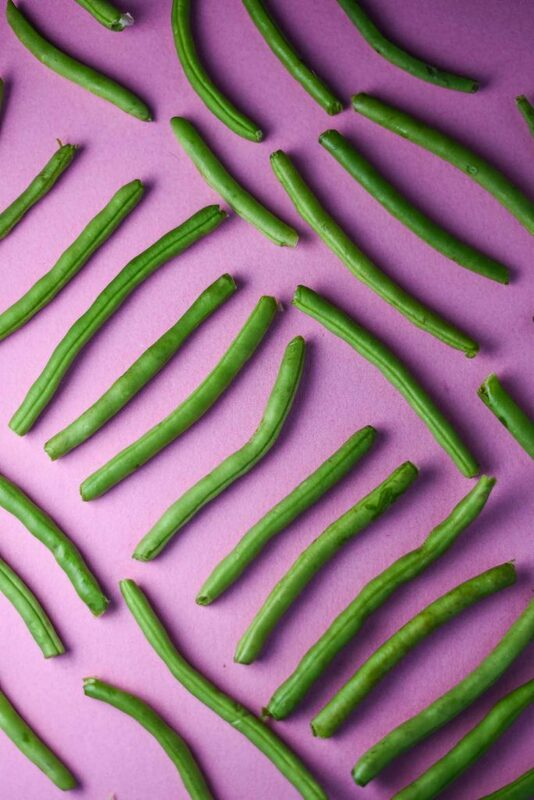 And if you make this vegan green bean casserole, let me know what you think by leaving a comment and rating the recipe or taking a picture and tagging it #plantandvine on Instagram. Cabernet Franc: Cabernet Franc is a great red wine option as it often has a savory and herby element that can stand up to the green beans. Think roasted pepper, red plum, leather, and chili pepper. Sauvignon Blanc: if you’re looking for a bright, grassy white wine to pair, Sauvignon Blanc is a good choice. You’ll get lime, kiwi, grass, and gooseberry flavors with a light refreshing body. Chenin Blanc: an aromatic white wine that provides clean acidity with flavors such as lemon, yellow apple, pear, and honey. The acidity is perfect for cutting across the creaminess of the mushroom sauce. 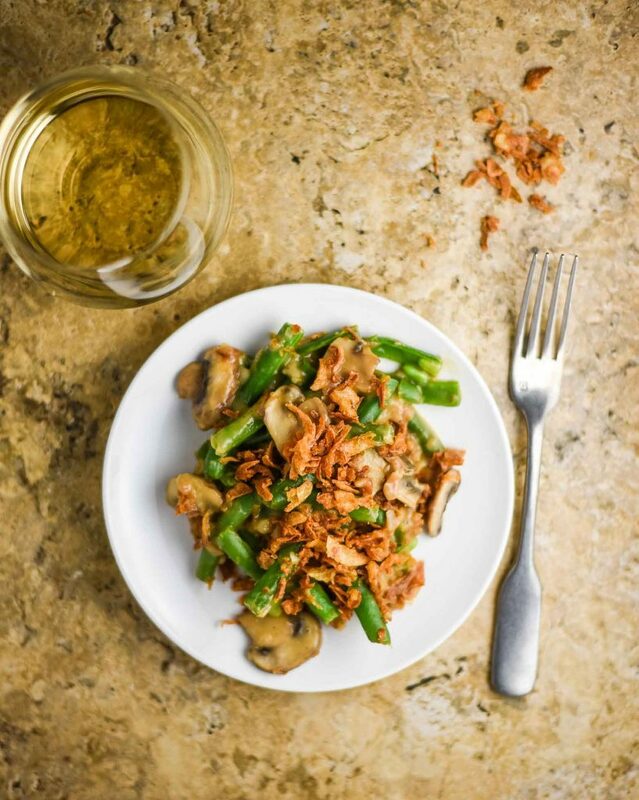 Vegan green bean casserole recipes that captures all of the nostalgic holiday deliciousness. Bring a large pot of generously salted water to a boil. Add green beans and cook for 5 minutes, stirring occasionally. Drain and quickly run cold water over the beans until cool so they stop cooking. Drain and set aside. To prepare sauce, add olive oil to large oven-safe skillet over medium heat. Once warm, add shallots and garlic. Season with salt and pepper and cook for 2-3 minutes, stirring occasionally. Add mushrooms and season with more salt and pepper. Cook for 3-4 minutes until lightly browned. Sprinkle in flour and stir to coat the veggies. Cook for 1 minute, then slowly add in veggie stock, stirring frequently so it blends and thickens. Add almond milk and stir frequently. Season with additional salt and pepper as needed and bring to a simmer, then reduce heat to low to thicken. Cook for 5-7 minutes, or until thick and bubbly. Taste and adjust seasonings as needed. Remove from heat. Add all cooked green beans and 1/3 of the fried onions (about 2/3 cup). Stir until well-coated. Top with remaining 1 1/3 cups of fried onions. Bake for 15 minutes, or until warmed through and bubbling. Serve immediately. Store leftovers in covered container in fridge up to 4 days. *Recipe is a guide. Adapt as desired. Adapted from Minimalist Baker.